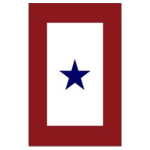 The Blue Star Mothers of America, Inc was founded as a Veteran Service Organization and was part of a movement to provide care packages to military member’s serving overseas and also provided assistance to families who encountered hardships as a result of their son or husband serving in the war. The Department of Defense specifies that family members authorized to display the flag include the wife, husband, mother, father, stepmother or father, parent through adoption, foster parents who stand or stood loco parentis, children, stepchildren, children through adoption, brothers, sisters and half brothers or sisters of a member of the Armed Forces of the United States. We are a non-profit 501-C3 veterans service organization which covers the Fredericksburg and surrounding areas. Several of our members live in the nearby areas some are south of Spotsylvania to Louisa, east of King George to Colonial Beach, west of Remington to Warrenton and parts of Stafford county. All are invited to our meetings and we welcome you to join us. Thanks for visiting our website. Check out our Projects. To get more information or if you have specific questions about our chapter please Contact Us. For Directions to our meeting location click on the directions link for marker in the map below.